The year was 988. 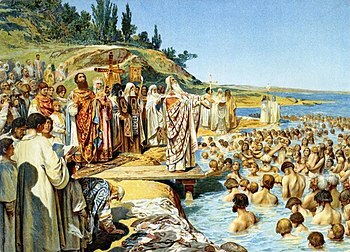 The inhabitants of Kiev came to the Dnieper River to be baptized. This event has been classed as a turning point, one that influenced the course of history. This month, all of Russia and the Russian diaspora celebrate the 1025 year of this event with liturgies, celebrations and banquets. Here, in Harrisonburg, things are pretty quiet. Someone asked me once why I found myself in the Russian Church since I had no Russian background or heritage. I must admit that I have no sense of loyalty to the Russian State. After all, the motto of my state is Sic Semper Tyrannis! I enjoy many aspects of Russian culture and history, but it is not my culture or my history. And as the Russians or Ukrainians who attend here can testify, I have no skill in the Russian language. So, why have I stayed in it? Also, what possible significance does this celebration have for me? Mainly, it is the Russian spiritual tradition which I find my home. St. Ignati, St. Theophan, the Optina Elders, the Saints of the Northern Thebaid, St. Theckla, etc. – it is from this stream that I draw my spiritual water. (Of course, I greatly love and admire the Greek Saints such as Necktarios, St. Cosmas Aitolos, etc.) It is a rich tradition that would not have existed had this event not occurred. Today, we remember the Great Prince Vladimir who helped to bring the Faith to the Russian lands. Little did he know that in about 500 years Constantinople would fall to Islam. If he had not embraced the Faith and led his people to it, the history of the world would be quite different. so that putting hope in Thee and in Thy majesty I will defeat all his plots. The spiritual tradition that I mentioned before illustrates that Russian Orthodoxy became a path to know the True God. It remains so today. What of true faith and a lack of deviation? The Russian people have faced Tartars, Mongols, Islam, the Swedes and the Germans, Napoleon, and the Bolsheviks. They have faced the influences of Europe and the aggression of militant atheism.Despite many days of darkness and defeat, the prayer of the Prince has proven to be true. The Russia Church clings to the True God and to its holy tradition. The Russian Orthodox Faith and been tried and tested, and yet has remained true and non-deviating. All the plots of the enemy have been defeated. What the future holds is yet to be known, but so far the gates of hell have not prevailed. We especially know this now because the story of millions of New Martyrs has now come to light. In this world where nothing is certain, where the political and religious ground is constantly moving under your feet, when there are wars and rumors of wars, strife and economic collapse, in a time of rising secularism, materialism, and hedonism, at time of compromise and relativism and nihilism, it is good to be in a Church that despite all thrown against it, continues to stand. May God make it so for all Orthodox Churches. So now, it is a question that you might ask yourself. If you stand in a Russian Orthodox sanctuary, why are you there? What does 1025 years mean to you? 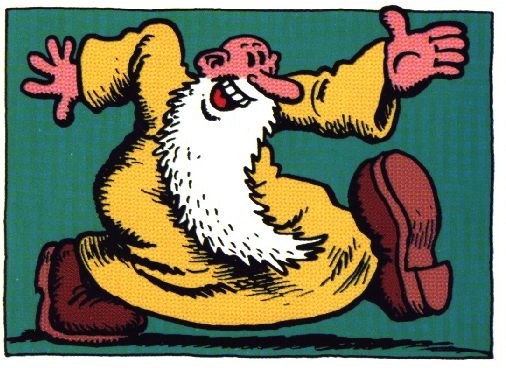 You are currently browsing the Ramblings of a Redneck Priest blog archives for July, 2013.